The government has today (26 July) published its policy paper setting out measures it is planning to take to tackle the UK’s illegal levels of nitrogen dioxide. Proposals were drawn up by officials from within the Department for Environment, Food and Rural Affairs (Defra) alongside the Department for Transport (DfT). Headline measures in the plan include a commitment to end the sale of diesel and petrol-only vehicles by 2040. The government has also outlined its intention to set a ‘national framework’ for steps local authorities need to take to clean up air locally. Proposals for a diesel scrappage scheme have not been formally approved, although government has said that it will consult in the autumn on the implementation of a ‘targeted’ scheme, where it can deliver value for taxpayers. 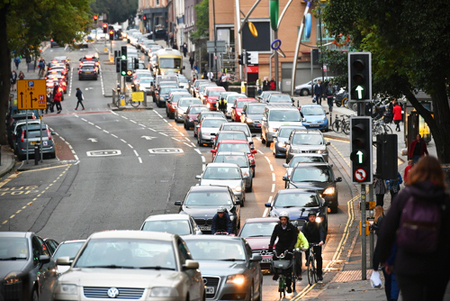 Within the paper, the government suggests that measures such as changes to road layouts at congested areas, retrofitting vehicles to use less-polluting powertrains and encouraging the use of public transport should be explored by local authorities. Measures such as restricting vehicle access and charging zones should be considered if other options are found to be insufficient. Councils are also being offered ‘direct financial support’ to implement measures aimed at tackling air pollution. This will include a £255 million ‘implementation fund’ for authorities, whilst £40 million will be made available “immediately” to support local authorities to take action ‘in the shortest time possible’. Local plans will be evaluated by Defra to ensure that they are “effective, fair, good value, and deliver the necessary air quality compliance.” Those deemed not to be sufficient will be required to “implement the measures necessary in their area to deliver the necessary improvement in the shortest time possible,” the government has said. Responding on behalf of local authorities, Councillor Martin Tett, Local Government Association environment spokesman, said: “Councils want to switch their focus from simply monitoring air quality to improving air quality. 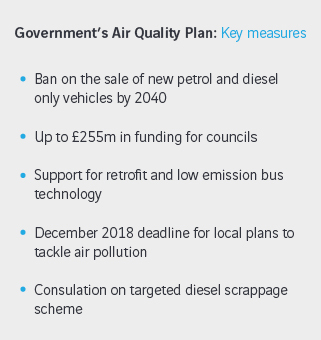 It is right that the government’s plan recognises the vital role councils have to play in achieving this and we are also pleased it recognises our call for extra funding for local authorities to tackle air quality. Councils now need to see more details to make sure these plans are as effective as possible. “Councils’ ability to understand the causes behind air quality issues in their areas is unique, because it is rooted in their unique understanding of their communities. That is why it is important that councils will have the flexibility to deliver their own plans to improve air quality in their areas, particularly with regard to clean air zones as well as expanded road and traffic measures. We have been calling for this for some time. Today’s plan marks the third set of measures put forward by government to tackle the UK’s NO2 emissions, with two previous versions of the plan having been ordered back to the drawing board following legal challenge by the environmental campaign group ClientEarth in 2015 and 2016.